Most people have heard of the renowned tale, the Ant and the Grasshopper. The Ant, who had always worked hard, became rich, while his old friend Grasshopper, who did nothing but sing and play, was still living in a run-down house without much things to eat. This tale originally criticized the Grasshopper for his laziness. However, in another version of the tale, the conversation between the Ant and the Grasshopper goes: “Look at you now. I told you a long time ago to work hard like me,” the Ant said. “My friend, I have never made a single regret in my life. I was most happy when I sang and that is it,” the Grasshopper replies. In this twisted version of the famous tall tale, the grasshopper’s singing is not depicted as a mere laziness but a worthwhile activity that he finds happiness in doing. Singing was to Grasshopper what working was to Ant. However, this is not how it is like with temporary employees who are still in their twenties. They are also known as the “88-generation,” named after the amount of money they make per month. “Next to the fact that it is hard for a 88-generation youth to get a stable paying job, the real problem is that they are losing confidence in what actually constitutes themselves,” said Nam Si-eon, the author of the book One Serving of Youth. The constituents of 88-generation cannot devote themselves to passion like the Grasshopper because they have to live up to reality’s needs. Neither can they work hard like the Ant because there are few jobs that provide such an environment. Therefore, they fall into a dilemma in which they fail to both be happy and earn money. Jang Kang-myung’s new novel, No Enthusiasm, Eva Road, is a story of a 88-generation man named Park Jong-hyeon and his friends, who are described as Japanese animation fans, also known as otaku. Jong-hyeon lives a normal life of any financially troubled youth, before he suddenly decides to travel around the world to finish the stamp rally of an anime series Neon Genesis Evangelion and progress on a documentary called, “Eva Road.” Through this novel, Jang introduces some very special members of the same generation who did not choose to give up their zeal in the direst situations, making an effective attempt to discourage the 20s of today from hanging by the grey zone of no enthusiasm and to help them find their true egos in demanding reality. This novel features a detailed look inside the reality of temporary employees by following the daily life of the protagonist. Through listening to the personal stories of the people Jong-hyeon encounters, the inconvenient truth of young generation is explicitly revealed. For example, when Jong-hyeon works at a small website building company, he meets a web designer who has great ability but is not willing to move to a bigger company where she can fully exhibit her talent. When he asks the reason of her stay, “You do not know how good our job is. We get to go home on time and the salary is punctual. No other company is like that,” was her answer. Her remark which is full of resignation is a clear illustration of the circumstance that breeds 88-generations, where even individuals with ability have a hard time receiving the most basic treatment from the company. Such maltreatment gives birth to lethargy and a helpless attitude, which influences the characters to the extent that they deliberately or naturally forget what they want to be good at. “The problem of 88-generations is that they are not noticed as individuals with ambition and ability but undifferentiated, identical work forces. There are so many young jobseekers today and it is hard for them to even find mediocre jobs that ensure proper payment and treatment,” said Jang. Because employment itself is such a challenging mission, the notion of finding excitement in doing something that one likes or is good at falls under the category of extravagancy. Just like its title, No Enthusiasm, Eva Road, the novel draws a realistic portrait of society in which youth are drained of self-identity under the public discouragement of enthusiasm. Jang successfully takes an example of otakus in his novel to represent the youth of 88-generation who still have their ego but have no choice but to hide them from the world. At work, the otakus suffer from the same loss of self-identity like the typical youth in crisis. Yet, they soon revive to consider themselves as the center of the universe as they imagine themselves in one of the significant scenes in animation. When asked the reason of their unconditional love towards Evangelion, Jong-hyeon states, “I feel that Evangelion is a good spokesman for my emotions. Before I watched the animation, I used to consider my hardships trivial because they seemed small compared to those in more agony than me. Yet, when I found out that even characters from Evangelion who serve the duty of saving the world have the same petty problems like mine, I could put some more value to my problems.” Just like how comparing oneself with Evangelion helped Jong-hyeon find out the significance of his feelings, watching and indulging in situations and characters of animation acts as a way for the otaku of 88-generation to confirm their true existence against the storm of uniformity that blows on them. “I do not consider myself as an otaku, because I have no interest in Japanese animations. However, I think I see some connection between them and myself when I realize that we both dig deep in something to become ourselves. I often write diary that I only keep to myself in as much concentration as otakus watching their favorite character. When I do that, I feel like I am free from all the outward influence,” said Cho Ik-bin, a Senior in the Major of Electronics in Kumoh Institute of Technology. Just as seen in the comment, otakus that appear odd are in fact similar to any man and woman in their youth with a secret hobby. No Enthusiasm, Eva Road is a metaphor made by the author to illustrate the twenties who seek their true selves not in reality but someplace else where they can be the owners of their life. 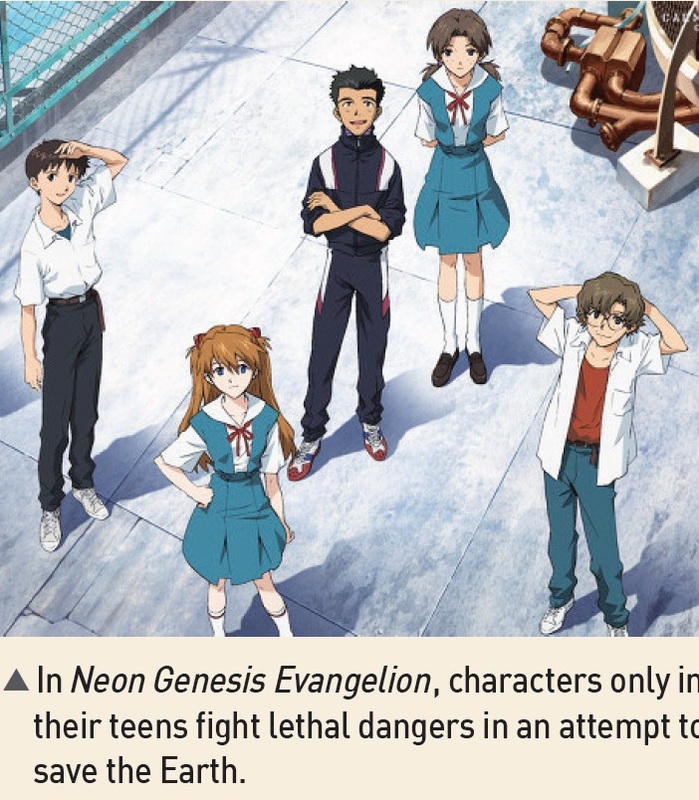 Different from the typical otakus whose fantasy ends along with the edges of their monitor, Jong-hyeon’s self-centered beliefs and agenda of action that he learns from Evangelion, stretch further to impact his real life. When he hears the news of Evangelion Stamp Rally, in which the first participant to visit four nations to get Evangelion stamps from designated cities gets a prize, he makes the craziest decision of his life to leave everything behind to shoot a documentary of him making the rally. He calls the documentary, “Eva Road.” When asked why he made such a choice by the author, he answers, “I just wanted to give a present to my youth until now. It has been spent on living for other people’s needs.” That he decided to make himself the protagonist of his actions is similar to the attitudes of otakus, but for the fact that he brought it to reality. The film turns out to be a great success as it is screened on Megabox, a major cinema company in Korea. “The most shocking part about the novel was that the film was actually successful. I felt vicarious satisfaction because by the time I read it, I was also thinking about doing a video project on my hobby,” said Lee Hyun-soo, a Freshman in the Major in Politics and Diplomacy of University of South California. His enthusiasm that he retained and spent on what he finds pleasure was not what the other 88-generation members had. His success, which in fact stemmed from making a work on what he could do best, is the fruit of his realized otaku-attitude. 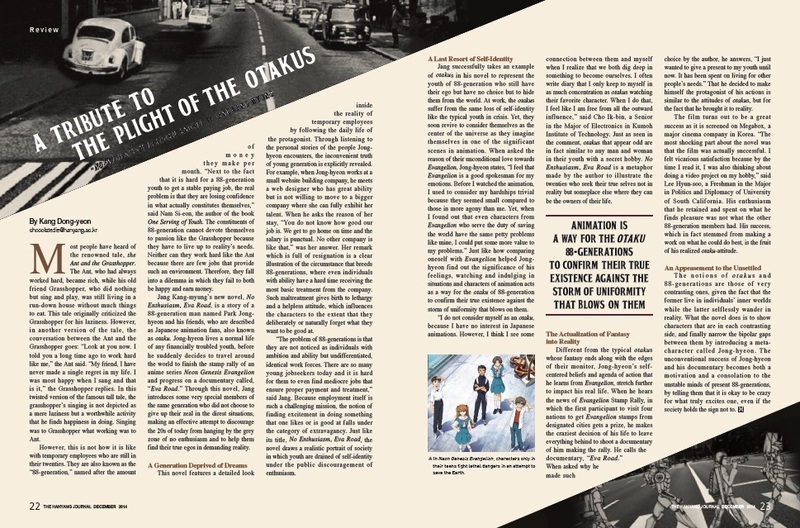 The notions of otakus and 88-generations are those of very contrasting ones, given the fact that the former live in individuals’ inner worlds while the latter selflessly wander in reality. What the novel does is to show characters that are in each contrasting side, and finally narrow the bipolar gaps between them by introducing a meta-character called Jong-hyeon. The unconventional success of Jong-hyeon and his documentary becomes both a motivation and a consolation to the unstable minds of present 88-generations, by telling them that it is okay to be crazy for what truly excites one, even if the society holds the sign not to.